Whispers in the Loggia: Francis' Feast – Pope's Hymn to Family "Is A Matter of Reaching Out to Everyone"
Francis' Feast – Pope's Hymn to Family "Is A Matter of Reaching Out to Everyone"
When you get to the part of Amoris Laetitia where the Pope says, “I certainly value feminism,” seeing the statement in a document of the Magisterium is enough to drop one’s jaw. Given the intensity of focus on the most prominent and charged front for those questions: the admission of civilly remarried couples to the Eucharist – a practice rejected categorically by St John Paul II in 1981’s Familiaris Consortio – Francis’ reluctance to “provide a new set of general rules, canonical in nature and applicable to all cases” while going on to say “that in an objective situation of sin… a person can be living in God’s grace, can love and can also grow in the life of grace and charity, while receiving the Church’s help to this end” is capped by another footnote (351) which begins, “In certain cases, this can include the help of the sacraments,” making reference to his earlier comments that the Confessional is not to be used as “a torture chamber” and "that the Eucharist 'is not a prize for the perfect, but a powerful medicine and nourishment for the weak.'" “[A] pastor cannot feel that it is enough simply to apply moral laws to those living in ‘irregular’ situations, as if they were stones to throw at people’s lives,” Francis writes. “This would bespeak the closed heart of one used to hiding behind the church’s teachings, ‘sitting on the chair of Moses and judging at times with superiority and superficiality difficult cases and wounded families’” – the Mosaic reference an echo to Jesus' Matthew 23 warning to the scribes and Pharisees about their hypocrisy. As for what it all means in practice, the old story bears recalling of the bishop who, on a visit to the CDF, was asked how prevalent internal forum conclusions for the remarried to receive Communion were in his area, only for the dumbfounded prelate to reply that the sacramentally-sealed nature of said discernment made it impossible to have any statistics on it. “In every situation,” the Pope says, “when dealing with those who have difficulties in living God’s law to the full, the invitation to pursue the via caritatis must be clearly heard. Fraternal charity is the first law of Christians.” By contrast, meanwhile, the one occasion where the pontiff calls anyone’s disposition to Communion in question is focused on his usual target: “When those who receive [the Eucharist] turn a blind eye to the poor and suffering, or consent to various forms of division, contempt and inequality,” he says, the Blessed Sacrament “is received unworthily” (186). All that said, even if Francis’ musing that “everyone should feel challenged by Chapter Eight” and its delving into discernment will likely get some significant takeup, the bulk of the mammoth text is disarmingly calm, dominated by lyrical reflections on family life, an extended meditation on 1 Corinthians 13 – St Paul’s treatise on love, the ever-ubiquitous reading at weddings – as well as a long take on the education of children and what appears to be a papal document’s first-ever citation of a movie (Babette’s Feast, long said to be the Pope’s favorite), not to mention a long quote from Dr Martin Luther King. For the most part, with the text’s easily accessible meditations on the dreams of family life, it wouldn’t be hard to see much of it adapted as some kind of guidebook for marriage preparation or ongoing ministry to couples. 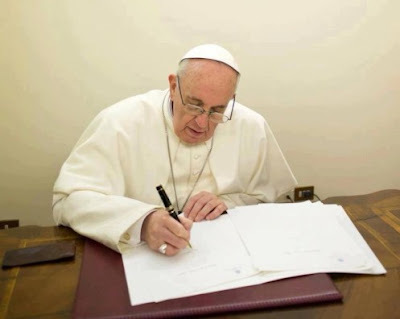 Yet while Amoris likewise echoes its precursor – the Pope’s 2013 “manifesto” text, Evangelii Gaudium – in featuring a host of passages from documents issued by the world’s bishops’ conferences, the most heavily-quoted sources are the closing Relatii of 2014’s Extraordinary Synod and last October’s Ordinary assembly, with the Pope often letting extended pieces of both take up a hefty portion of the document, giving those lines the added weight of his teaching authority in the process. In other turns, the same elevation is given to several homilies and General Audience catecheses given by Francis over his three-year reign, most notably the blockbuster February 2015 preach to the last Consistory for the creation of cardinals, where the pontiff sought to hammer home his belief that the way of the church must be "the way of Jesus" – namely, "the path of reinstatement." As for individual fingerprints on the finished product, especially in Francis’ weighing of the more fraught pastoral realities, Amoris’ conclusions on natural law, the weight of conscience in individual discernment – “We are called to form consciences,” he says, “not replace them” – and the Pope’s call for “respectful pastoral guidance… that those who manifest a homosexual orientation can receive the assistance they need to understand and fully carry out God’s will in their lives” are strikingly clear echoes of comments made during the 2015 Synod by his top US appointee to date, Archbishop Blase Cupich of Chicago. Shortly after the October gathering ended, word got back that, having been present there as the Pope's choice (in addition to four elected USCCB delegates), at one point Cupich was privately buttonholed by the Pope with praise for the points he was making. Suffice it to say, now we’ve got the proof.